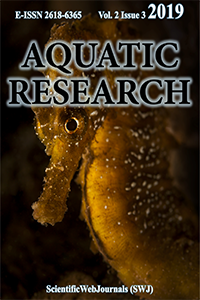 “AQUATIC RESEARCH" journal is an international, scientific, open access periodical published in accordance with indepen­dent, unbiased, and double-blinded peer-review principles. Journal aims to contribute to the literature by publishing manuscripts at the highest scientific level on all fields of aquatic sciences. The journal publishes research, short communication, and review articles that are prepared in accordance with the ethical guidelines and charge not article submission, processing or publication fees. in the form of research, short communication, and review articles. Peer-reviewed open access journal publishes articles quarterly in English or Turkish language and have not submission, processing or publication charges (cost free).